Three Emory health sciences faculty were winners in the Atlanta Business Chronicle's 2014 Health Care Heroes competition (l-r): Kate Moore (military service) Mylin Torres (rising star), and Will Sharp (allied health). 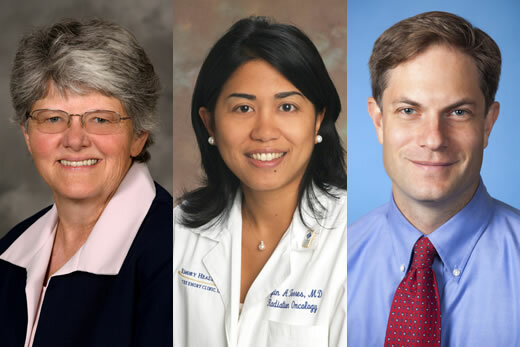 The Atlanta Business Chronicle recently chose three Emory faculty as winners and four faculty and students as finalists in its 2014 Health Care Heroes competition. Kate Moore, winner in the "military service" category, is associate clinical professor in the Nell Hodgson Woodruff School of Nursing and director of the Evans Center and Simulation Lab. She retired from the U.S. Army Reserves last year as a colonel, after providing medical services in Central and South America and serving as assistant chief nurse of the 10th Combat Support Hospital in Baghdad’s Green Zone. At Emory, Moore is providng students with patient simulation experiences that mimic what they will typically see as nurses in the ER, the delivery room, a pediatric clinic, or a long-term care facility. Will Sharp, winner in the "allied health" category, directs the Pediatric Feeding Disorders Program at Marcus Autism Center and is an assistant professor of medicine at Emory University School of Medicine. He has dedicated his career to improving treatment and access to care for children with autism who may have intense eating disorders. Mylin Torres, winner in the "rising star” category, is a radiation oncologist at Winship Cancer Institute and an assistant professor in Emory University School of Medicine. As both an attending physician and an active researcher, Torres devotes her efforts to building a breast cancer radiation oncology clinical and research program that provides outstanding patient care and addresses problems of therapy-related side effects like fatigue, depression, anxiety, sleep disturbances and skin toxicity. James Eckman, a finalist in the "physician" category, is professor emeritus of hematology and oncology at Emory University School of Medicine and Winship Cancer Institute and founder and former director of the Georgia Comprehensive Sickle Cell Center at Grady Health System. Through 35 years of leadership, Eckman cared for more than 3,000 patients and became an international leader in sickle cell screening and advanced, compassionate care. Kirk Kanter, a finalist in the "health-care innovation" category, is a professor of surgery at Emory University School of Medicine and a pediatric heart surgeon at Children’s Healthcare of Atlanta. In collaboration with Georgia Tech and Emory, Kanter has pioneered a new computer-based system that gives pediatric heart surgeons the ability to model multiple surgical approaches and define and practice an optimum surgical plan. Using the new 3-D computational modeling technology, surgeons can virtually move arteries, close holes, and predict the response of heart and lungs before the actual surgery. Raul Nogueira, a finalist in the "physician" category, is director of the neuroendovascular service at the Marcus Stroke and Neuroscience Center of Grady Memorial Hospital and an associate professor of medicine at Emory School of Medicine. With more than 800 procedures performed in just over three years at the center, Nogueira continues to look for ways to improve patient care and outcomes in ischemic stroke, including pioneering a minimally invasive endovascular procedure to remove blood clots in the brain. Robert Mannino, a finalist in the "rising star" category, is a recent graduate of Georgia Tech now pursuing a PhD in the Wallace H. Coulter Department of Biomedical Engineering at Georgia Tech and Emory. Mannino is working with faculty member Wilbur Lam to design devices that can detect abnormally high levels of iron resulting from blood transfusions, which is a risk in many developing countries and can lead to organ failure.